Colchester United manager Tony Humes says he has every faith in goalkeeper Elliot Parish. The 25-year-old is set to replace U's keeper Sam Walker, who suffered a knee injury in the League Cup defeat by Championship side Reading on Tuesday. Parish played in the club's opening-day 2-2 draw with Blackpool. "We have every confidence in Elliot Parish," Humes told BBC Essex. "It is a blow to lose Sam but he will have our full support during his rehab." Colchester were knocked out of the League Cup in extra-time by a late Chris Gunter strike, but Humes remains undeterred ahead of the U's trip to Peterborough on Saturday. "We've found it hard against Peterborough in recent times and have been on the end of some tough results," he said. "But we went there last season and got a good win, so that should give us the belief." 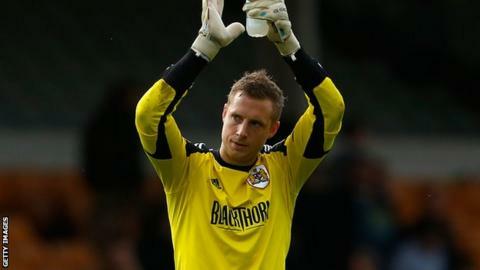 Former Blackpool goalkeeper Parish will almost certainly start in goal against Posh. "It's an unfortunate set of circumstances but I've got to take my chance," he said. "I've got aspirations to be at the top level and it's opportunities like this that I have to take. Colchester will check on the fitness of Chris Porter after he missed Tuesday's game with an ankle injury. George Elokobi will travel with the squad and could make the bench as he continues to regain full fitness. Meanwhile, full-back Kane Vincent-Young, 19, has signed a new two-year contract with Colchester.